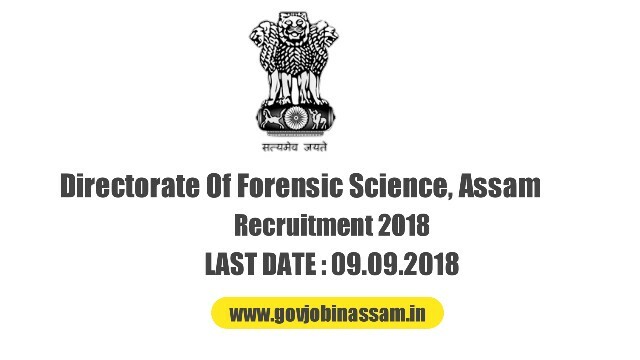 Invited application from Directorate of Forensic Science, Assam Recruitment for the Viscera Cutter in two post interested candidate may apply offline for the Job. Applications received after due date will not be entertained. ▪️ Grade Pay Rs.3900/- p.m. The candidates should not be less than 18 years and not above 44 years as on 01.07.2018. 5 years age relaxation for SC and ST candidate. Interested candidate may apply offline for the Viscera Cutter job through Directorate Of Forensic Science, Assam postal address at The Directorate of Forensic Science, Assam, Kahilipara, Guwahati -781019. Submit your offline application before 9th September 2018. Submit your application on standard forum along with 2 copies of recent passport size photograph signed by the candidate. attested copies of certificates/testimonials regarding educational qualification, age, caste etc. one self addressed stamped envelope (size 27 cm x 13 cm) should reach the Directorate of Forensic Science, please download official advertisement for other teams and conditions.